When you install Thunderbird, it will attempt to detect your port and server settings. If it's successful, Thunderbird sets up your email with just a few clicks. If it can't, you must enter them manually. Note: Not looking for the Workspace Email Thunderbird instructins? See the Office 365 Thunderbird email set up or the Professional Email Thunderbird email set up articles. 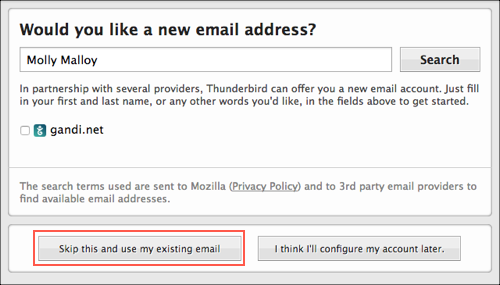 Note: First time setting up a Thunderbird email account? See install Thunderbird. In the Accounts section, under Create a new account: click Email. Click Skip this and use my existing email. Email Address Workspace Email account email address. Password Workspace Email account password. 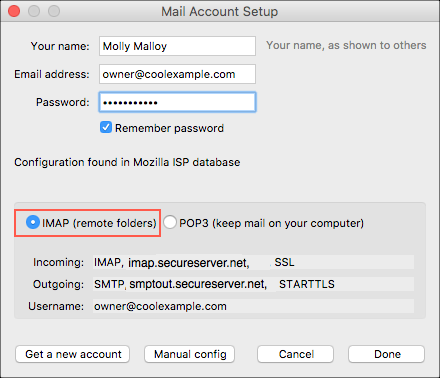 Confirm or select the IMAP (remote folders) setting.